The Terry Miller Legislative Office Building, April 20, 2016; the temporary location for the Alaska House and Senate for the 2016 extended legislative session. It’s been more than two weeks since the Legislature was scheduled to finish its session. But not only have lawmakers not finished their work, there’s been little progress recently – at least in public. There have been no public meetings on the contentious oil and gas tax bill. And no recent meetings on the state budget or making changes to the Permanent Fund. A wide-ranging education bill emphasizing local and parental control failed after a vote in the Alaska House on Wednesday. 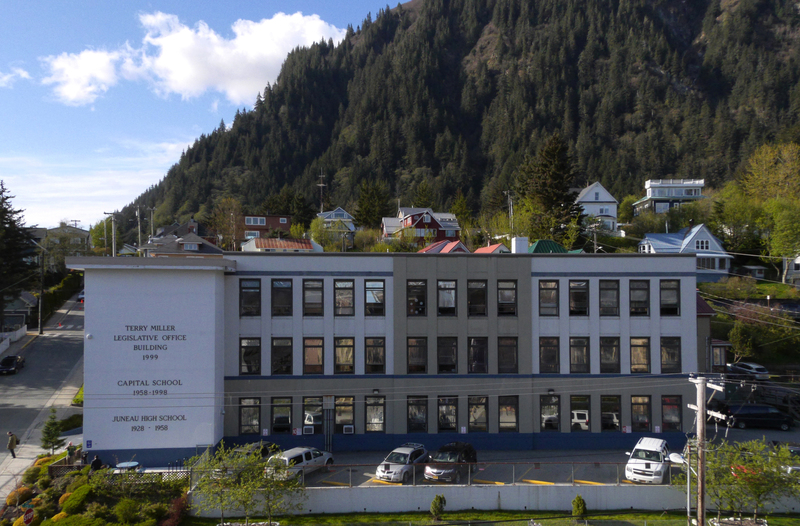 Many of Alaska’s rural schools are failing. Low student performance and high teacher turnover are just two of more obvious indicators of problems in these mostly Native school districts. Those working in the schools say it’s time for radical changes. Investigators with the National Transportation Safety Board say a plane that crashed on April 20 killing four people hit a bald eagle before it crashed. A grass fire near Wasilla was reported by a pilot about Wednesday afternoon. The fire has burned into the trees and is covering about 7 acres, according to state fire information officer Norm McDonald. A Sitka property wiped out by last year’s deadly landslide is still taxable, at least according to city code. AC Quickstop opened Bethel’s first liquor store in more than four decades on Tuesday. A line of about 10 people were waiting for the historic doors to open. Researchers are trying to determine whether strong winds blowing over the Valley of 10,000 Smokes on the Alaska Peninsula can transport dangerous amounts of ash into the Kodiak environment.